Bhim App Offers and Promo Codes for UPI Payments. Go cashless and unite the demonetization movement with Bhim App. Bharat Interface For Money Application ensue from national payments corporation. Bhim programme falls under a government scheme and all transactions happen underneath the unified payment interface so friends what could be a more secure way for online payments. Bhim App has been launched by Mr. Narendra Modi, Indian Prime Minister. This app is giving a healthy competition to its priors. The program has took a very good care of its customers by giving cash prizes on various transactions.This app is very simple to use and is full fledged with features. Installation is very quick because you only have to verify the mobile number which has been already registered to your bank. Bhim App deals with direct bank to bank payments which allows the facility of straight away money transfer to other bank accounts. 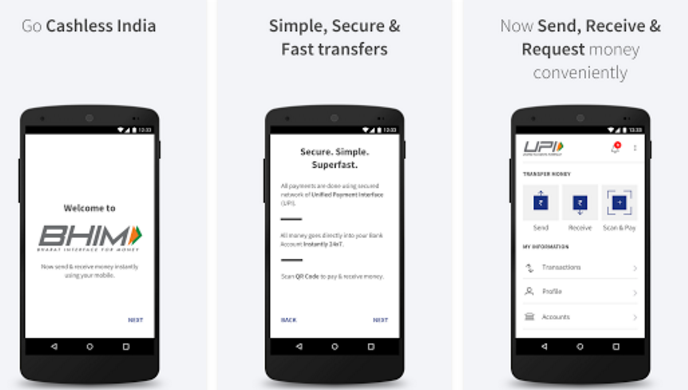 Fund transfer under this app is instant with 24 × 7 availability. Apart from online shopping, bill payments, movie tickets, food and travel purposes, Bhim is a full package with features like upi support, check balance, transaction limits, other language support etc. Therefore you can also use Bhim as your banking app. This will simplify your fund transfer experience. QR code scanner feature of this app enables you to send and receive money quickly. Also, generate your own QR code for ease of transactions.This app is very similar to Phonepe app by Flipkart, you can check here all Phonepe App Offers. Do a atleast one transaction from any UPI app and stand a chance to win cashback up to Rs. 50000. Promo Codes for Adding Money to Freecharge Wallet. Working Coupons for Ebay New Users. How to Register at Bhim App ? 2) Select the mobile type whether single or dual sim. 3) Number that has been registered to your bank, should be used for verification. 4) Further your mobile number will act as your payment address. 5) Set four digit pass code. 6) Select your bank from the list. 7) Now you are good to go and enjoy the simply fastest way of transaction. 1) Bank registered mobile number should be used for verification on Bhim App. 2) Cash prizes are available on RuPay card, USSD etc. 3) Mobile number verification may cost you Rs. 1.50 via sms.